Rare 4 bedroom floorplan in McCormick Ranch. 4BR 2Bath with pool, completely remodeled. Tile floor in all common areas. New kitchen with granite countertops and new cabinets. New bathrooms with granite countertops and new vanities. Stainless steel appliances, HE washer and dryer. Dual zone AC. Large corner lot in cul-de-sac. Insulated 2 car garage with cabinets, storage, and workroom. 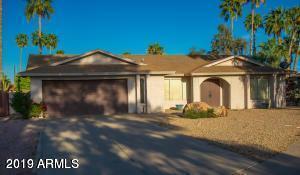 Close to walking paths, park, Pavilions, and Salt River Fields. Scottsdale school district: Kiva Elementary, Mohave Middle School, Saguaro HS.